I wanted to write a short note on the use of the terms “sunspots” and “active regions” when discussing structure on the Sun’s surface. To do that, however, requires an aside as to the nature of the Sun’s surface itself. The Sun has a core where hydrogen is built into helium at a temperature of millions of degrees. As we move further away from the core, the temperature drops (as one would expect). At some point, we reach a point where the density has dropped to a point where photons can escape and stream outwards. This radius, at 695,500 km (or 1 solar radius), is deemed the location of the Sun’s surface, which we call the photosphere. The photosphere is 5800 K in temperature (nearly 10,000 degrees Fahrenheit! ), and above it lies the lowest part of the solar atmosphere, called the chromosphere. The chromosphere is at similar temperatures to the photosphere. 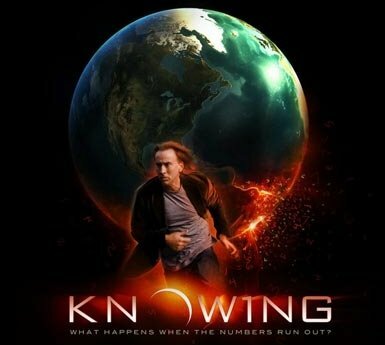 However, between the chromosphere and the outer solar atmosphere, called the corona, there is a region of intense temperature increase, and the corona reaches temperatures of over one million Kelvin. It’s important to take a moment to realize the absurdity of this: the region further from the Sun is hotter than the surface of the Sun. Everything we know about hot objects relies on the simple fact that they feel cooler the further we are from them. If you put your hand near an open flame, it is heated. As you pull your hand away, it cools. 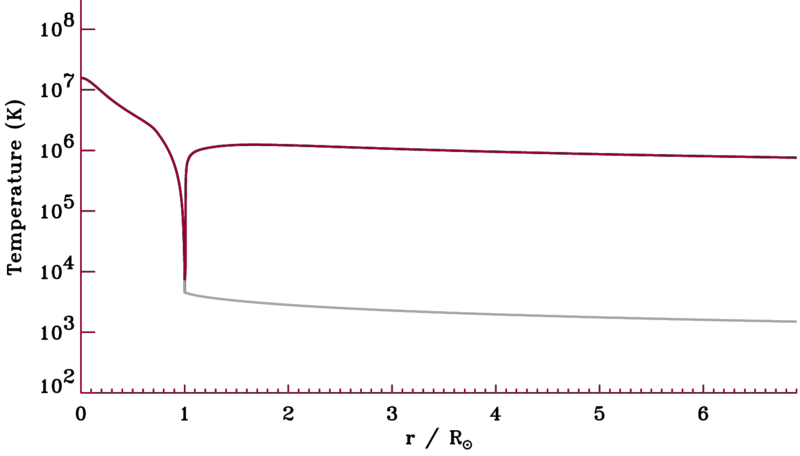 The light grey curve in the plot below shows what we expect for the temperature of the Sun as we move away from its surface at r = 1 solar radius. However, the maroon line shows on a log-log scale what the previous graph was showing us: there is a thin transition region where temperatures skyrocket to millions of degrees. Although there is a whole field of research looking into the physical processes to explain this, scientists have not yet definitively determined the causes. Crazy stuff! Back to the matter at hand, however. I’ve introduced the terms for the Sun’s surface (the photosphere) and the Sun’s atmosphere (the chromosphere and corona). This distinction is key to understanding the relation between sunspots and active regions on the Sun. Sunspots are cooler patches of plasma at the photosphere. They are at a lower temperature because magnetic field lines are bursting out of the Sun’s interior and restricting the flow of hot plasma from reaching those parts of the surface. 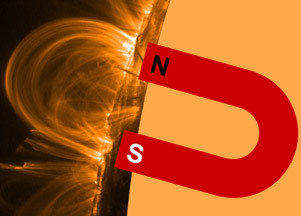 Sunspots come in pairs, since these emerging field lines form loops with the two opposite-polarity footpoints defining the locations of the sunspot pairs. To take observations of the photosphere of the Sun, we need to use visible wavelengths, such as the 4500 Angstrom observation in the middle of the three-image figure below. If we instead look at shorter wavelengths, corresponding to ultraviolet light, we are seeing plasma that has been trapped along these magnetic field loops and has been transported into the corona. Big, bright active regions in ultraviolet observations are usually found directly above the sunspots seen in visible-light observations. Scientists find the shorter wavelength observations much more useful because they reveal so much detail. See for yourself! 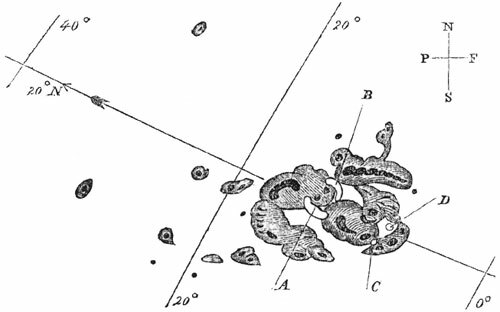 Note that some active regions lie above sunspots that are small enough (or warm enough) not to appear in the visible-light images. All in all, the short answer of what the difference is between sunspots and active regions is that there isn’t one in a sense. 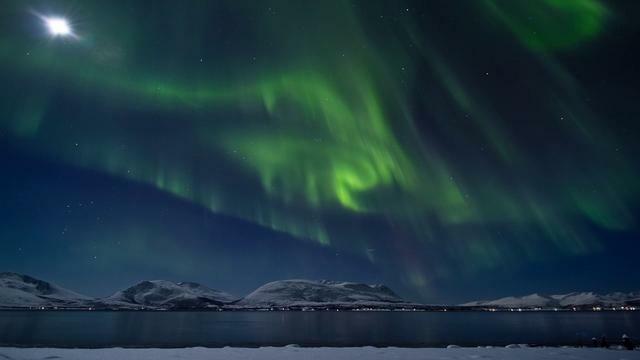 Both are specific indicators of strong magnetic fields above the surface of the Sun, the kinds of magnetic fields that can release flares and coronal mass ejections. It kind of makes you think twice when you look up at the rather uniform bright yellow spot in the sky. It’s an exciting time right now, when humans have finally made it to interstellar space. 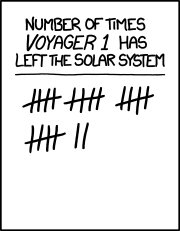 If you haven’t heard, Voyager 1 has exited the heliosphere. And this time we mean it! Seriously, though, the news has been all over the internet lauding this most recent confirmation that Voyager 1 has made it out (see JPL Press Release). The real question, however, is out of what? Put simply, the discovery being presented is that the plasma densities that Voyager 1 is measuring have increased significantly, suggesting it has moved out of the sphere of influence created by the constant outflow from the Sun we call the Solar Wind. This outflow creates a cozy little bubble called the heliosphere, but this is only one way to measure the extent of the Sun’s influence. When the Solar wind slows down because of the increased pressure of the interstellar medium, it sets up a termination shock as it decelerates past the speed of sound (think of this as a sonic boom, backwards). There is then a region of the outer heliosphere called the heliosheath, and the idea right now is that Voyager 1 has made it out of this region. You’re likely familiar with the eight (not nine!) planets of the Solar System and the fact that they orbit the Sun because they are gravitationally bound (if this second point is troublesome, perhaps review this wikipedia article) What you may be less aware of are the other main sources of material in our little neighborhood. The asteroid belt, containing dwarf planet Ceres, lies between Mars and Jupiter. The Kuiper belt, containing among other things dwarf planets Pluto and Eris, lies just beyond the orbit of Neptune. The Oort Cloud best represents the extent of the Sun’s gravitational influence, as it is a spherical cloud extending from a few thousand AU from the Sun to a few hundred thousand AU. 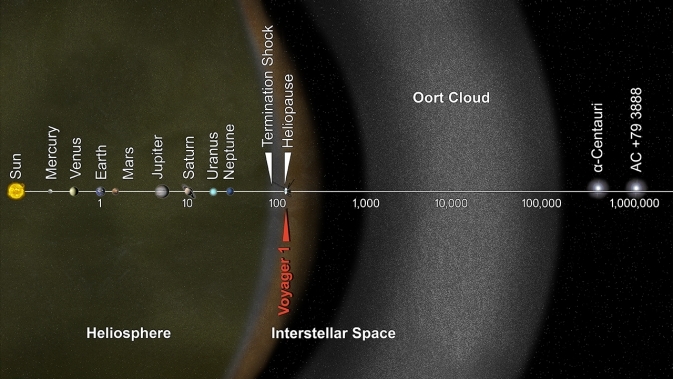 The Oort Cloud is the source of most of the long-period comets we see coming through the inner solar system. Voyager 1 and 2 will be long dead before their trajectories bring them anywhere close to this “edge of the Solar System,” so it isn’t surprising that as a species we’d prefer to take the smaller victory of making it out of the heliosphere. Finally, if we consider the Sun’s furthest possible influence, we would have to travel five billion light-years away, where the first rays of light emitted by our newborn star are currently streaming outward at the speed of light. Five billion light-years is equivalent to 2.9×10^22 miles i.e. 29,000,000,000,000,000,000,000 miles (for the curious, this would be 29 sextillion miles in America or 47 trilliard kilometers in France). This certainly puts our accomplishments with the Voyagers into perspective. To track these satellites real-time, check out http://voyager.jpl.nasa.gov/where/. toward further darknesses, but moving also toward a new sun. As I write this, I am still working out the likelihood I will be able to post regular updates. This is mostly due to the fact that I have never blogged before (we will conveniently ignore the xanga page I had in middle school), and the only pen-and-paper journal I have been able to keep for longer than two weeks is one of the five-year one-sentence-per-day versions. However, I do know that this is a reasonable place to collect my thoughts and gather yours. If you are an astronomer, I’d like to know if there is any specific aspect of solar physics that has helped you in your research or provided progress in your field. If you are not an astronomer, rather more probable, than I am more than happy to answer any questions you have about any topic in astronomy; just leave a comment on this post or use the following contact form to send me an email.